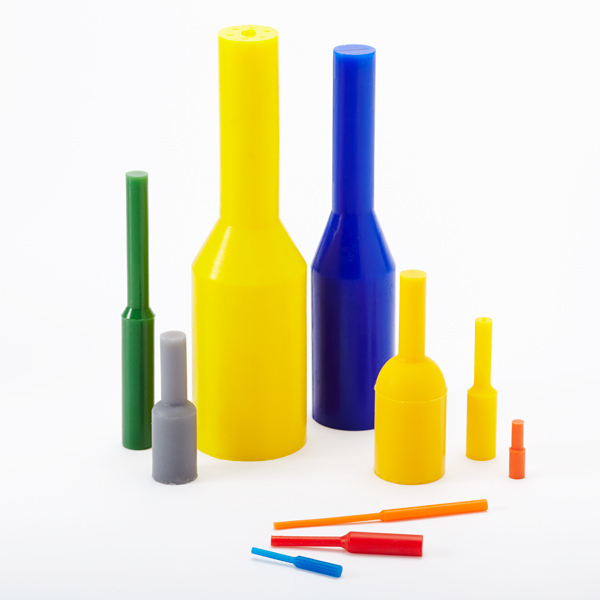 Our Silicone Pull Plug (SPP) product line is the industry standard solution for threaded and non-threaded through holes in powder coating and E-coating applications. With many sizes available, holes from 0.050” to 2.250” in diameter can easily be plugged. 0.158 Plug Dia. X 0.093 Tag D"
0.158 Plug Dia. X 1.500" Plug"
0.160 Major Dia. X 0.118" Min"
0.175 Plug Dia. X 0.123" TagD"
0.236 Plug Dia. X 0.165" TagD"
0.265 Plug Dia. X 0.186" TagD"
0.275 Plug Diameter X 0.130" "
0.281 Plug Diameter X 0.138" "
0.312 Plug Diameter X 0.147 t"
0.370 Plug X 0.187" Tag X 0.4"
0.437 Plug Dia. X 0.306" TagD"
0.468 MD X 0.250"TD X 1.250"p"
0.580 Plug Dia. X 0.315" Tag "
0.590 Plug Dia. X 0.250 Tag D"
0.700 Plug Dia. X 0.371" TagD"
0.729 Plug Dia. X 0.386" TagD"
0.740 X 1.890" tag X 1.890"LS"
0.770 Plug Dia. X 0.408" TagD"